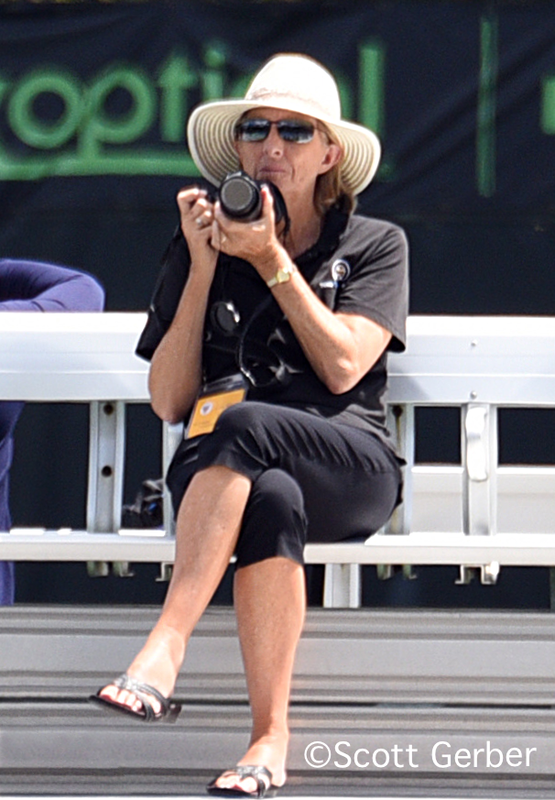 Five Americans--four girls and 1 boy--have advanced to Friday's quarterfinals with third round wins on a warm and humid day at the USTA Billie Jean King National Tennis Center. Four American victories were assured, with four all-US third round matches. The only American to pick up a win over an international player was wild card Carson Branstine, who beat No. 15 seed Yuki Naito of Japan 6-4, 6-1, her second straight win over a seed. "I'm playing really good tennis right now, so I'm pretty happy," said Branstine, who turns 16 Friday. "I was down 3-1 in the first, but I still felt pretty comfortable. She came out strong, but I stuck to my game plan and it worked out for me. She was a good player, liked to take the ball early, she was very smart, and I knew if I didn't focus, she would take her chances, so I'm very happy I got the win." Branstine has the power and the accompanying ability to hit winners, both on her serve and her forehand, that puts many of a match's points on her racquet. "Usually in most matches, I'm the more dominant player," said the Orange, California resident, who received a wild card into the Open based on her third place finish last month in the San Diego 18s Nationals. "I like to control the points with big serves, big forehands, even big backhands a lot. I just know that if I'm playing well, I'm capable of anything." One player who has given Branstine difficulty is No. 5 seed Kayla Day, who advanced to a quarterfinal encounter with Branstine by claiming a 6-3, 6-2 decision over qualifier Kylie McKenzie. Day defeated Branstine handily in the semifinals in San Diego on her way to the title, but Day is careful not to be overconfident. "Carson's a really good player and she's had a really good tournament so far," said Day, who turns 17 later this month. "Knowing her game style will help me a little bit and I know what to expect." Day, who beat Madison Brengle in the first round of the women's event last week with the wild card she received for winning San Diego, thought her game was particularly sharp today. "I played really well today," said Day, who didn't face a break point. "I served really well and that's what helped me stay on top. Every time it got close, I was able to come out with some really good serves that pushed me out in front. I just played really solid overall and I was really happy with the way I played." Branstine, who has lost twice to Day in the past 12 months, is hoping Day's level drops a bit on Friday. "Kayla's been doing amazing," said Branstine. "She won the Hard Courts (San Diego), she came here and won a round in the main draw of the women's and she's obviously feeling very good about her tennis now. She's beat me pretty badly the last couple of times; at Hard Courts she beat me 6-0, 6-1. She played out of her mind, I have to give it to her, she played unbelievable. And at Tulsa last year, it was 2&0 or 0&2. So hopefully tomorrow I can do a little bit better, or win." Also still in the bottom half of the girls draw is lucky loser Vanessa Ong, who continued her improbable run with a 6-3, 6-2 win over No. 16 seed Alexandra Sanford. 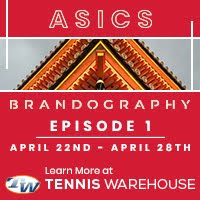 Ong, who was the third player on the USA's 14-and-under World Junior Tennis team, playing only doubles for the finalists, said she was able to figure out what she needed to do against Sanford and execute that strategy. "I tried the standard patterns, looking for her weaknesses," said the 14-year-old from Oklahoma. "I figured out that her forehand was her weaker side, so I just kept playing her forehand, but also attacking her backhand a good percentage of the time." After breaking Sanford for a second time to serve for the match, Ong faced her only two break points in the set. She saved them both however, and with two good first serves, closed out the match over the ITF's 18th-ranked junior. "I feel really comfortable, a lot better than I used to," Ong said of her ability to close out a match. "I used to be a jumble of nerves. It might be experience, it might be coaching, I don't know, but it's something." Ong will play No. 7 seed Bianca Andreescu of Canada next, who came from 7-5, 5-2 down against No. 9 seed Usue Arconada to earn a 5-7, 7-5, 6-3 win. Arconada served for the match at both 5-2 and 5-4, but never got to match point, with Andreescu winning eight straight games to go up 3-0 in the third set. The top half of the draw will feature No. 13 seed Viktoria Kuzmova of Slovakia, who beat No. 4 seed Amanda Anisimova 6-2, 4-6, 6-4, against Tessa Andrianjafitrimo of France, who defeated Taylor Johnson 6-2, 6-2, in one quarterfinal. In the other, top seed Anastasia Potapova of Russia, a 6-4, 6-1 winner over Katie Swan of Great Britain, will face 2015 finalist Sonya Kenin, who saved a match point in her 4-6, 7-6(1), 6-3 win over qualifier Ashley Lahey. Kenin, who had not seen Lahey play since last year, said she was taken by surprised by the 16-year-old's level. "She was playing really well today," said Kenin, who lost to women's finalist Karolina Pliskova in the first round last week, after winning a wild card into the main draw. "I wasn't really expecting that, but once the match started, I had to play well." After dropping the first set, Kenin served for the second at 5-4, but Lahey broke and held to put the pressure back on Kenin. After a medical timeout, in which she received treatment on her right thigh, Kenin served to get into a tiebreaker. After a double fault at 40-30, then a Kenin forehand long, Lahey had a match point, but Lahey missed a forehand badly. Although there were two more deuces, Lahey didn't get another chance, with Kenin dominating the tiebreaker. After a heat rule break, Kenin moved into a 3-0 lead in the final set, which Lahey eventually challenged by breaking back, but couldn't pull herself to even in the set. When Kenin finally closed it out, she had spent three hours on court, but had survived. 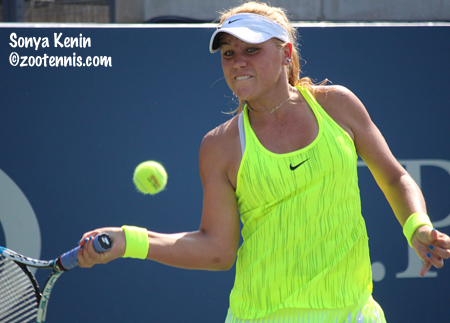 Kenin is determined not to compare her performance this year to last year. "Of course I'm aware that I was here last year in the finals," said the 17-year-old from Florida. "But if I think about it too much, there's too much pressure, so I just try to take it one match at a time." Potapova has two straight-sets quarterfinal wins over Kenin in the past 12 months, one on clay at the Grade 1 in Yucatan and one on grass, at the Grade 1 in Roehampton. 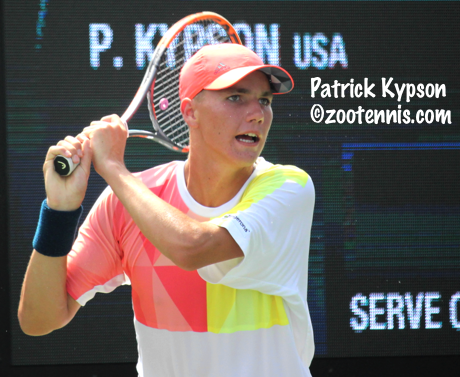 The only US boy to reach the quarterfinals this year, after four American boys were in the quarterfinals last year, is qualifier Patrick Kypson, who beat JJ Wolf 2-6, 6-3, 6-0. The 16-year-old Kypson admitted that he was feeling the effects of his four previous matches at the start, but that it was Wolf who appeared run out of gas as the match progressed. "The first set was tough," said Kypson, who had beaten Wolf the last time they played, in the semifinals of the 16s last year in Kalamazoo. "I had a break point in the second game and I wasn't able to capitalize and from there, he all of a sudden believed that he was going to win that set pretty easily. I sensed that pressure and I got a little cautious with my play and he took advantage of that. He wasn't missing many forehands and it's tough to know where he's going with his shots, because his technique is good." "In the second set, he looked like he was tired a little bit," Kypson said. "If he was tired, I was fine with that. It looked like he got even more tired as the set progressed. He took a medical timeout at 3-0, said his leg was cramping up a little bit. But it was tough. When he doesn't move and he hits the ball hard, it's not easy. He hits super flat, super hard, even not moving, I still have to do my part." Next up for Kypson is No. 6 seed Felix Auger-Aliassime, who avenged his loss in last week's Grade 1 in Canada to Alejandro Fokina Davidovich of Spain 6-4, 7-6(6). Auger-Aliassime beat Kypson in the first round of the Eddie Herr Grade 1 last year, en route to the title. "Tomorrow's going to be super tough against Felix," said Kypson. "But the way I'm playing, the way I'm competing, if I get myself in the match, I have a chance of winning. He beat me pretty badly last year do I'm looking forward to it, on a different surface, getting out there again." Top seed Stefanos Tsitsipas of Greece will play his doubles partner Kenneth Raisma of Estonia in the quarterfinals, while Khumoyun Sultonov of Uzbekistan, the only other unseeded boy aside from Kypson in the quarterfinals, plays No. 7 seed Yosuke Watanuki of Japan. Watanuki eliminated wild card Sebastian Korda 6-7(5), 6-2, 6-2 in a night match on Court 17. College Park Grade 1 champion Miomir Kecmanovic of Serbia, the No. 5 seed, will play No. 13 seed Nicola Kuhn of Spain. The doubles semifinals are set for Saturday, with two US girls teams still alive. Unseeded Kayla Day and Caroline Dolehide beat Wimbledon champions and No. 3 seeds Usue Arconada and Claire Liu 6-3, 4-6, 10-3 in the quarterfinals and will play Mai Hontama of Japan and Anastasia Zarytska of Ukraine, who received a walkover into the semifinals. Wild cards Jada Hart and Ena Shibahara also eliminated an American team, beating Morgan Coppoc and Taylor Johnson 6-2, 6-3. They will play No. 5 seeds Kaja Juvan of Slovenia and Iga Swiatek of Poland. The only US boys in the quarterfinals, wild cards Sean Sculley and Nick Stachowiak, lost Thursday, to Toru Horie and Yuta Shimizu of Japan 6-3, 2-6, 10-2. Day and Auger-Aliassime are the only two juniors still playing in both doubles and singles. Junior matches are scheduled for both the new Grandstand and Court 17 on Friday, so streaming should be available at ESPN3. Thai Kwiatkowski, Virginia def. Michael Redlicki, Arkansas 6-4, 3-0, ret. Ryan Shane, Virginia, def. Jared Hiltzik, Illinois 6-4, 6-2.